Eggs can be a delicious and nutritious part of a healthy diet. In fact, if your diet allows, I would argue that they should be a regular part of your healthy diet. In moderation, of course. 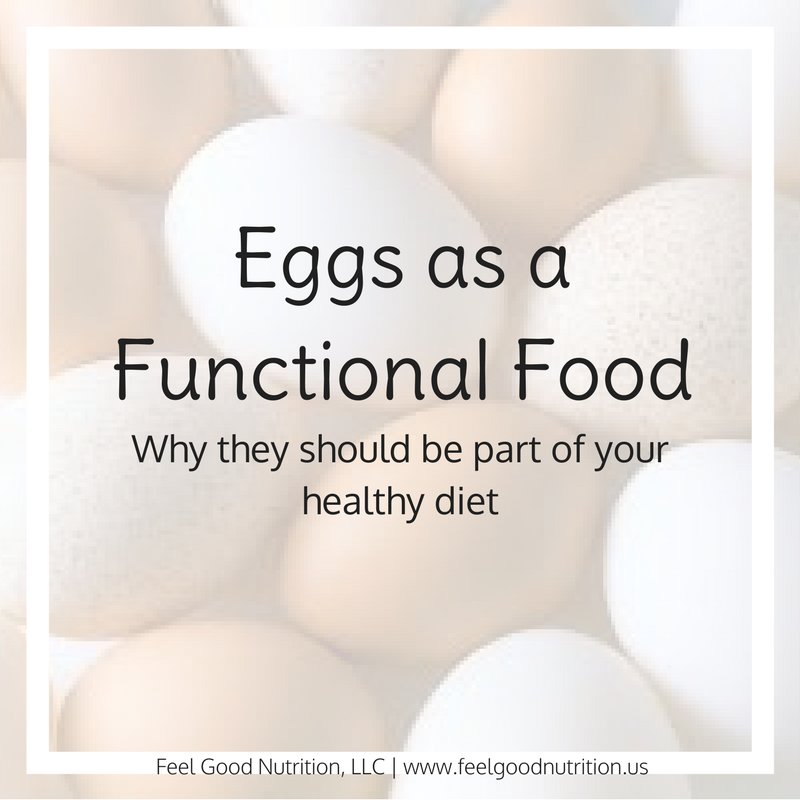 Let’s talk about eggs as a functional food. A functional food is a food that has positive effects on health beyond basic nutrition. First, What Are the Basics? Eggs are in expensive and a moderate source of calories that provide significant nutrition. Here’s the breakdown for 1 large egg (or about 50g). This nutrition label shows that eggs are a good source of protein and unsaturated fat and contain no carbohydrates. Despite this facts, eggs get a lot of grief for their high levels of saturated fat and cholesterol. We used to think there was a link between egg consumption and increased risk of heart disease, now it appears that research is unclear but that eggs can be part of a healthy diet. Now we know, for most of the population, dietary cholesterol, like in eggs, has very little effect on blood cholesterol levels and heart disease. When buying eggs, we now can buy omega-3 enriched eggs from chickens that have been fed a diet high in flax seed. One omega-3 enriched egg has the equivalent of about 400-450mg of omega-3 fats (a combination of DHA and EPA). The correct dose for you is dependent on your age, size, and health status but this is a good place to start. Research shows that omega-3 fatty acids have great anti-inflammatory capabilities which is important because so many of today’s diseases are rooted in inflammation. Omega-3’s can reduce the risk and symptoms of diseases like heart attack, stroke, several forms of cancer and various autoimmune diseases. What Are the Other Advantages to Eating Eggs? 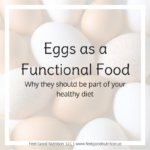 Some of the important components found in eggs are zinc, biotin, carotenoids, lecithin and choline many of which are deficient in our SAD diet (standard American diet). Let’s break these down to understand their roles in preventing chronic and infectious diseases through their antimicrobial, anti-cancer, anti-oxidant and anti-hypertensive properties. Lecithin is an important component of the cells in our body. It plays a direct role in antioxidant activity by decreasing damage to our cell membranes by reactive oxygen species, like free radicals, which are responsible for many diseases including cancer, inflammatory joint diseases (arthritis), diabetes, and most degenerative diseases. Eggs are one of few food sources that contain high concentrations of choline. This vitamin-like nutrient is important for chemical messengers in our brain, called neurotransmitters, and plays an essential role in normal brain development. They are important for far more than just our brain. Choline also plays a role in fat metabolism could lead to fatty liver in someone who is choline deficient. The American Medical Association has recently voted to include choline in prenatal vitamins to reduce the risk of birth defects. Carotenoids are pigments that give egg yolk its natural yellow color. Your body cannot make the carotenoids in eggs and relies on dietary intake. Other places to get carotenoids are vegetables. This makes egg consumption especially important for those people who consume low amounts of vegetables. Carotenoids help improve vision and reduce the risk of macular degeneration and age-related cataracts. I always remember my grandpa telling me to eat carrots if I wanted to keep my eye sight 😊. I guess I could have also eaten more eggs! Over 300 different enzymes in the body rely on zinc to complete their chemical reactions. It is also very important in the structure of proteins and cell walls. If zinc is deficient, these processes can’t take place. It is estimated that 2 billion people worldwide have a milder zinc deficiency. This is also important because zinc interacts with many other nutrients like copper, calcium, folate and iron. Don’t eat your eggs raw. Eggs are a great source of biotin – they provide approx. ¼ of the recommended intake for the day. There is an enzyme in egg whites, avidin, that binds to the biotin in eggs and does not allow your body to absorb it. Trust me, you want to reach your biotin intake because they play an important role in metabolism of carbohydrates, protein and fat. It also plays a major role in the health of our hair, skin and nails. Looking for ways to incorporate more eggs into your diet? Dairy Free Fudgesicles – customize your own! This is a fantastic quick recipe, thank you for the detailed recipe.